How Are We Doing? Where Are We Going? What Have I Learned? Reflecting on life lessons, Leslie Ann recounted the first twenty years of her life as the child of an alcoholic father. She experienced all of the emotion and pain that such a relationship carries with it. However, at the age of 44 her father became sober through the balance of his life and taught her, “It’s never too late to change”, a lesson that has shaped her into the inspiring leader she has become. It is this lesson that has directed her leadership of the United Way and guided her in her mission to help right some of the most pervasive social wrongs in our community. As the first female manager in the nation of a collegiate football team, she learned “there are no limitations due to gender,” an experience that would equip her with the necessary acumen and confidence to interact with men in the locker room or the Boardroom. These life lessons, while not all-inclusive, were pivotally instrumental in propelling Leslie Ann into a life focused on social and organizational change, leaving us a gift we should all cherish for many years to come. In response to donor’s expectations that the needle move in a positive direction as a result of continued asks and gifts of financial support, the organization accepted the charge to embark on a mission of changing the “human condition,” once felt an improbable goal. With this transformation, the organization embarked on a quest, aptly referred to as the “Agenda for Change,” focusing on Education, Income, and Health; and has moved the needle in the right direction, evidenced by the decreases in recidivism rates, decreases in homeless families and improved outcome because of partnerships with parents. Successes abound, but the work must continue. With a strong belief that people, circumstances, and conditions can change, our community can, and will continue change, with the hope that Madison will become one of the Best Places to Live and Work for all its citizens. Thank you, Leslie Ann, for your leadership, insight, and unrelenting quest for change. If we all believe in the possibility of change, it will become our reality! Did you miss out meeting this week? CLICK to watch the video. 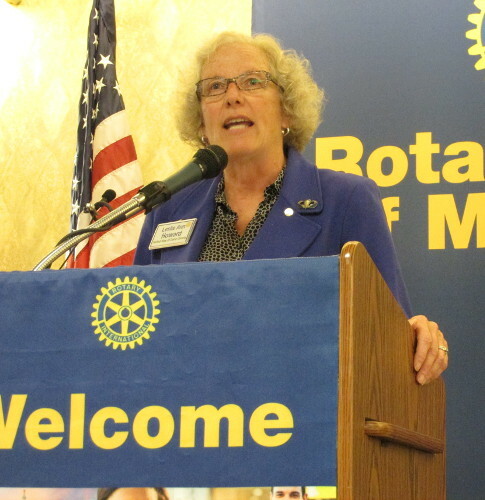 This entry was posted in Rotary Club of Madison, Rotary Club of Madison Guest Speaker and tagged Leslie Ann Howard, Rotary Club of Madison, Rotary Club of Madison Guest Speaker, United Way of Dane County. Bookmark the permalink.